i've jumped into the world of concertina playing relatively recently. My interest centers around Irish music and early-mid 20th century folk/pub tunes so I selected an Anglo concertina. I'm still learning but I have really fallen in love with the instrument and taken to it in a way that other instruments have vexed me or led to a falling out. As many before I fell victim to the split between uncertainty if this was for me, and buying a quality instrument. I ended up purchasing This Bonetti 30 button Anglo concertina from Amazon. While it isn't awful judging by what I can gather about beginner/Chinese instruments, after a few months of nearly daily practice and online lessons, I'm seeing its shortcomings. While it can be hard to get clear measurements on many models, it is definitely larger and less agile than some, at 7 3/4" across the flats. I also have trouble reaching the air button with my thumb, and have adopted a bad habit of cheating with my right index finger. I don't have basis for comparison for bellows stiffness, but I do seem to be moving in bigger pushes and pulls to get the same sound as the video instructors, and being that the air button is hard to reach, makes this a compounding problem. I'm hoping for suggestions of a long-term learning and playing instrument. I'm not really looking to step into another beginner instrument if there is a more intermediate option. However, I'm not prepared to spend $2000 just yet. Is there something that would take me further than the Rochelle or Wren 2 for less than $1500? Would there be any notable red flags with this one from barleycorn? Jones concertinas are assumed to be of at times debatable quality by some - but I'd say you can be confident this this is one of the better examples from Chris' advertising. I think at this point, I haven't used the accidentals enough to be beholden to any one pattern. C# on the upper right is about all I've used as most of my lessons and fun playing have been c, G and D key tunes But I appreciate the insight into the brand. All pricing being nominally similar, any strong opinions on the CC minstrel hybrid vs the Jones vintage? I have a strong oppinion to choose vintage concertinas over hybrids in general - but that's just me. My two anglos are both hybrid, one Wheatstone layout, one Jeffries layout. I may get a vintage anglo at some point but these two hybrids both sound different from each other and from my vintage Cranes. And frankly, I like that difference. So, I would say that you should find one that has a sound the you like and fits you playing style ... note that I'm probably too old to seriously try Irish at this point! I would recommend the Minstrel from Concertina Connection. You can get one for $1475.00 with the bag or $1550.00 with the hard case, which I would recommend. It plays very well and is 6.25 across the flats instead of the 7.25 on the Rochelle. This alone makes a huge difference in playability. The action is much quicker along with bellows being leather for more ease of playing. 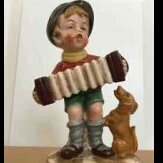 The Minstrel was developed as a step up from a beginner concertina without having to lay out another $2000.00 to obtain a playable instrument. Gremich, do you own one? My biggest concern is distance from the back of the strap to the air button. I haven't figured out if the distance on the bonetti is unusually large or if I just have tiny presidential hands. I was going to measure that distance when I get home. Was hoping someone could compare. Reenact, in the meantime you could try mounting an air button lever to help reach the button. I just did this for a friend who is having the same problem. I used a thin piece of wood (like a popsicle stick or tongue depressor) about 5/8 " wide, and 1" long. I glued a piece of stiffish scrap leather the same width and about 1/2" longer to the face of the stick. Then I glued the protruding length of leather to the top of the hand-bar where the thumb rests, and secured it with a small screw counter-sunk into the leather. This creates a hinged flap that rests on top of the air button. Your thumb lies along it, and makes it easy to depress the air button (you may have to cut a slight angle where the flap meets the Hand-bar in order to centre it over the button. If you just want to try it out, a stick and duct tape will work temporarily. I have an old German-made concertina where an air lever is original equipment (see attached), and I often wonder why it isn't more common. I do know a few folks who have commissioned top modern makers to put levers or melodeon style buttons on their instruments. I believe I saw a Marcus for sale here that was called a "travel" size and was less than 6" across. Looked very nice. One thing about the Marcus Traveller - for its size it's VERY, VERY, LOUD - blow yer socks off two fields away. All are (just?) in the same ball-park as far as price goes (import duty would be an 'extra' - do we pay duty on imported vintage musical instruments? ).